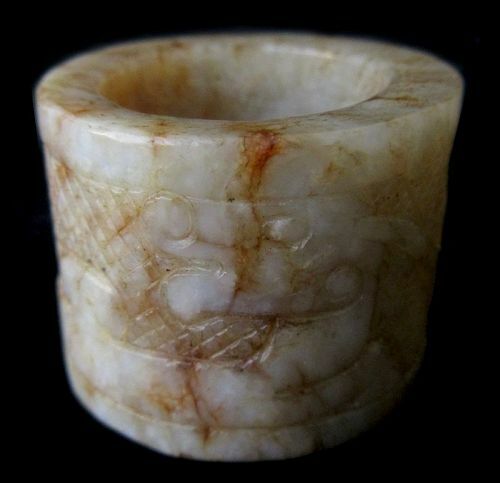 Antique Chinese jade archer's ring. The edges are hand-carved with the image of a chimera over a crosshatch ground. Antique Chinese porcelain bowl, of an oval form with ribbed sides and a famille rose color palette. 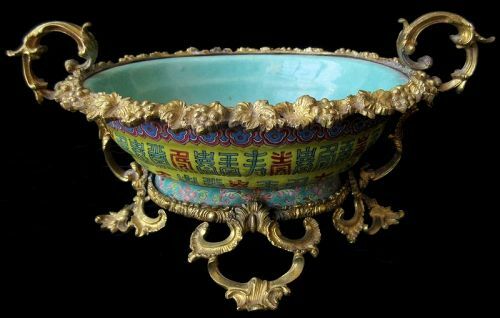 The yellow sides are incised with various Chinese inscriptions in blue glaze while several key characters are glazed in red. The foot is tall and deeply recessed with a red seal of Daoguang (1821-1850). The bowl is placed within a dramatic metal display of a fleur de lys design, raising it on narcissus style legs. 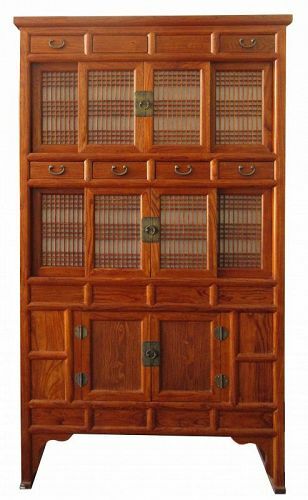 Contemporary Korean single section kitchen cabinet, made with bold elm wood (Keyaki in Japanese). This piece has an upper and lower set of sliding doors with attractive latticework over rice paper. The top and mid region have four small drawers across, with the very top middle drawers as hidden compartments. The bottom of the piece has two doors on hinges, and a middle lock to match the others. A charming candlestick figure of Ashinaga, a playful spirit in Japanese folklore with incredibly long legs. His counterpart, Tenaga, is the long-armed spirit who would ride on Ashinaga's shoulders and, working together, they would catch many fish from the ocean. Ashinaga is hand-carved with adorable features. 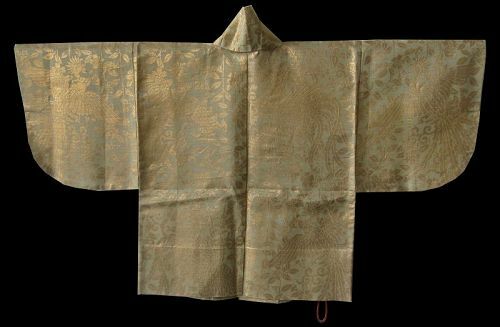 A beautiful Japanese haori, a traditional mid-waist coat similar to a kimono. 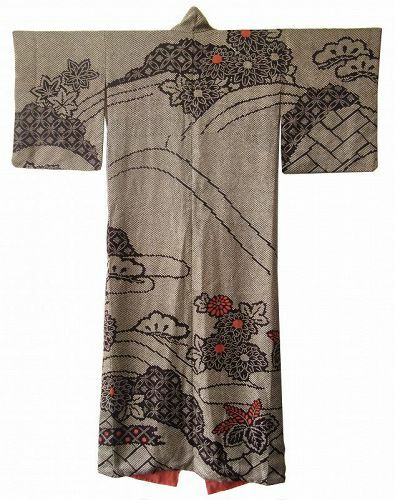 Hand-woven with intricate gold thread motifs of flying phoenixes and cherry blossoms on branches against a white ground. The haori is either worn open or closed by the cord in front. 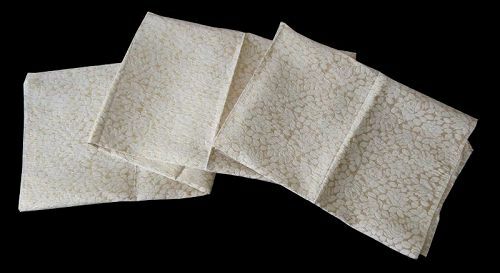 Japanese section of silk fabric, hand-woven in cream white and gold thread in delicate patterns of flowers. 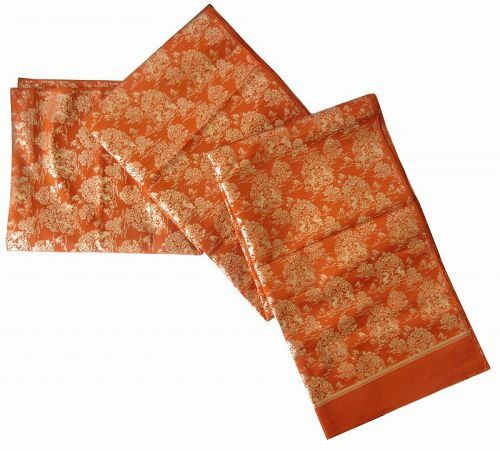 Antique Japanese 15ft long section of silk fabric, hand-woven with gold thread in motifs of flora and fauna on a bright orange background. Size: 180" L (15ft) x 27.5"
Japanese silk kimono with shibori style ground, motifs of coins with peonies, kiri leaves, pine trees, and other floral elements against geometric patterns. Splashes of pink add a touch of feminine color to the kimono. 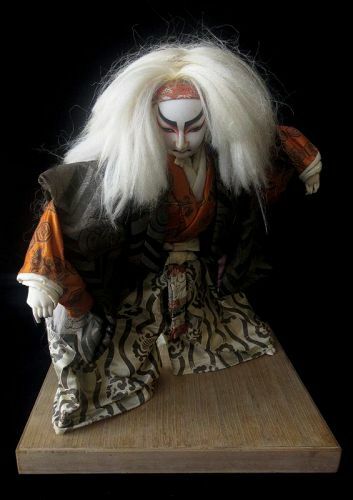 Japanese kabuki actor doll, dressed as a fearsome white lion with long, flowing mane, made with real hair. He wears silk garments of bright orange, white and grey, with his face done in traditional cat eye makeup of white, black, and red. 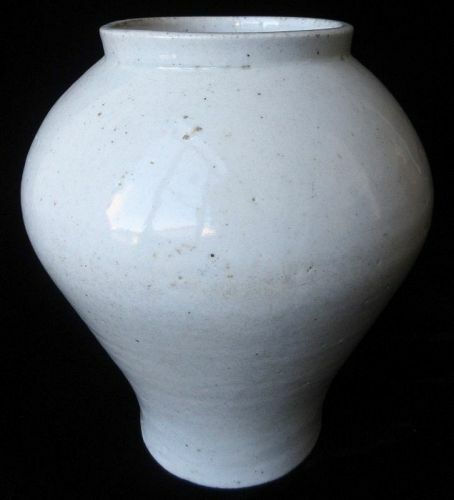 A large Korean porcelain jar, glazed in a transparent white with slight blue undertones. The upper body is rounded, with a short, flat rim and glazed interior. The lower body tapers down with a slightly fluting foot, left bare along the rim.